Last weekend I took my own advice and surrendered to the now of my life. Two big, heavy wooden doors opened like wings and I came home to dance between them. One of the dearest friends of my life introduced me (kicking and screaming all the way) to dance more than ten years ago. But she, in her infinite female wisdom, nagged and niggled and poked and prodded until at last I agreed to try it. Once. Just to get her to shut up about it! So I tried it and found myself there, waiting. I rarely missed a dance for years and years afterward. Ours was a small group of dancers, ebbing and flowing over the years, but the core group remained remarkably the same. Sometimes there were only two of us. It didn’t matter. It was a safe place, a place to be with myself in candlelight, a place to be in my body without thought, shame or responsibility. Everything happened at dance. We raged, we sobbed, we hurt, we lay on the floor. We shouted and clapped, farted, belched, giggled, played, pounded on the walls and danced until we drooled. It’s one of the few places in my life where I’ve felt I belonged. Leaving my dance group was the most painful loss when I left my old life and came to Maine. I knew I could never replace it, but I hoped to find another place, another group, another dance. The farmhouse I live in is more than a hundred years old and that means the ceilings are low. I don’t need a lot of room to dance by myself, but I do need to be able to move freely. I did dance a couple of times the first winter and spring I was here, but I had to make myself small so I didn’t scrape the ceiling with my hands and my mind was filled with what I’d left behind. It was so painful I didn’t want to face it again. In Colorado we danced in a yoga studio. It was a beautiful space—clean, high ceilinged, wood floored. Perfect. Our little town was safe after dark, the studio was easily accessible, it was heated, there was a bathroom available and for most of us it was less than a five minute drive to get there. Since I’ve come to Maine I’ve searched for a local group. I’ve talked to several women about dance. Some have been intrigued, but they’re busy, or they have partners, or we don’t live very close together, or there’s no place to get together and do it. You know. Here, the nearest town is twenty minutes away in good weather. I’m sure there are places in town we might use, but I don’t know where. Or who. Or how. I’m intimidated and overwhelmed and it seems ridiculous to try to find a suitable gathering place when there’s no dance group to use it. So I stopped trying. Too painful. After all, now I have a partner to hang out with in the evenings. I told myself I’d keep thinking about it, look for openings, and eventually, maybe, be able to start another group. Or even find one. One day. When we had more money. If we moved somewhere else. If we had a better car that could actually deal with driving on winter nights. But this summer there’s a lot of movement and change, not all of it comfortable. I’m learning a lot. I’m feeling a lot. Writing is good, and so is swimming, but dance accesses something deeper. I’ve known for a few weeks now I need to find a way to get back into those depths for my sake and for the sake of my loved ones. So I decided to quit playing games with myself and figure this out. 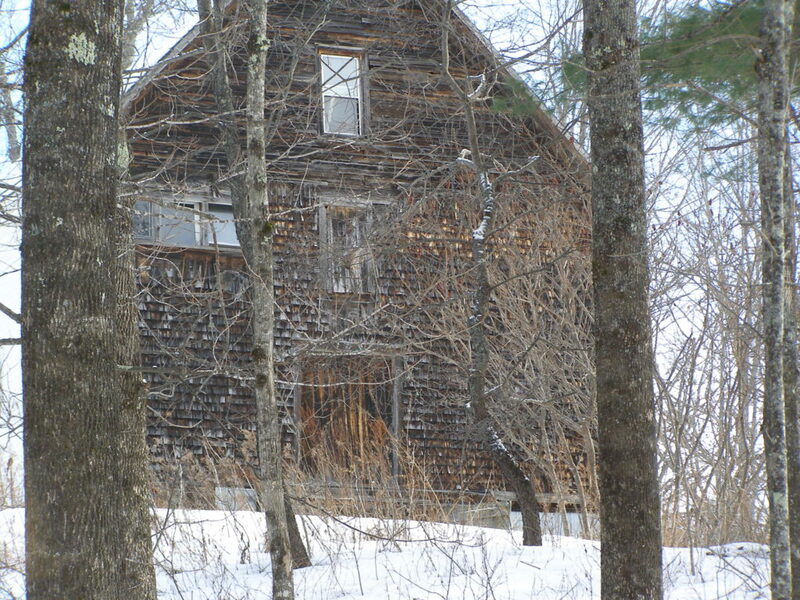 Naturally, an old farmhouse in Maine comes equipped with a barn. Ours is a total of four stories, a typical New England nineteenth century barn There’s a bat colony in the top of it and it’s an apartment house for rodents. It’s constructed of gorgeous beams and posts, high ceilings, huge blocks of stone in the foundation. Windows look across the tops of the trees and over the river valley, most of them without glass now. We have six cords of hardwood stored in the garage level and miscellaneous stuff on the top two floors. 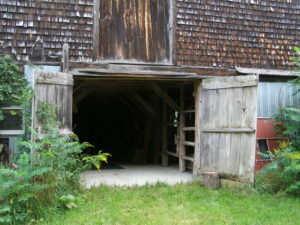 The spirit of the building is in the bottom, though, which is accessed through two huge heavy wooden doors that are permanently propped open in the back of the building. This area is mostly underground and the stone foundation can be clearly seen. There are old pens and animal stalls built by hand from the plentiful wood here; not boards, but logs and saplings, rough cut. The mowed area in front of this lower floor is not visible from house, driveway or road and is surrounded by trees. So, I built a playlist of good music, a mix of old familiar dance tunes and some new discoveries. I swept and raked, picked up trash and got rid of some impressive spider webs. I found an old rusty tin can, filled it with dirt and stuck incense in it. I put on a skirt and some jewelry, found a pair of light shoes I thought would work (I’ve always danced barefoot), grabbed a yoga mat to sit in the grass and stretch on and went to see what would happen. They were all there, my dancers. It seemed to me I could almost reach out and touch them. 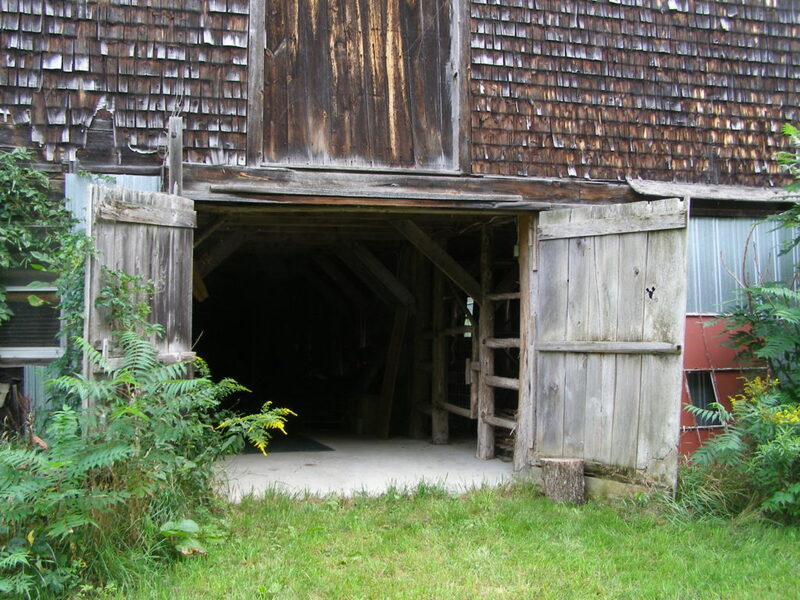 They mingled with the ghosts of animals who once lived in this barn, long dead; generations of birds, now flown from empty nests in the rafters; and the dirty lace of old cobwebs. My feet felt clumsy and heavy in shoes and it wasn’t night, but my body remembered how to move and my brain remembered how to lie down and rest. The music swept me up, pushed me with sharp elbows and knees, shook me by the scruff of the neck, played with me and soothed me. I danced with my expectations, my stories, my fears and limitations and loss. I danced with my disappointment and grief and rage. I threw down my rigidity, refusal and denial and danced in their blood. I danced with the joy of coming back to myself. I danced in an old barn, in a new life, but not alone. The past is still with me, the dancers I knew green and supple in my memory. The pain of change is not, after all, too great to bear. I don’t need money. I don’t need a better car. I don’t need anything that hasn’t been here all along. I don’t need to wait for anyone else or anything else. I just needed to surrender to what is now. So this one’s for you, my dear Bobbi; for you, Jill, in all your beautiful sensitivity; for you, Rena, who taught me so much about strength, courage and being real; and for you, Pat, who brought essential balance to our group and allowed us to dance with a playful small boy. Half a world away, you all still honor my dance with your presence. The experience of dance is a hard thing to convey to someone who’s never done it. I’ve written extensively about it, however, in my book. Please see ‘The Hanged Man’ page for a new excerpt. This entry was posted in Authenticity and tagged change, dance, denial, expectations, fear, feeling, grief, learning, limitations, loss, money, rage, refuse, rigidity, stories, surrender, swimming, writing on September 1, 2016 by Jenny Rose. Jen! I will dance with you! I am in love with this! never heard about it before! A super great idea. ..Carmine will probably agree that I really need to loosen up and just Dance!